Musicians agonize. Whether it be in the performance of a Bach cello suite, a Chopin nocturne, Perotinus’ Viderunt Omnes or any other piece from any other period in music history, the worries are usually big. “Is this the right bowing for the Allemande; should my left hand have a stable tempo in this nocturne, while my right hand plays rubato and adds ornaments without restraint; at what speed should the upper voices move in this organum?” These questions are often related to a certain kind of historical awareness. Or to put it more precisely: they are related to most musician’s conviction that the performance of music should relate to what the composer is generally assumed to have intended, or to what is believed to be idiomatic to the specific performance style of the historic context in which the piece was born. People go at great length to achieve this blessed state – the state of being „historically informed“ as to the performance practice of a certain kind of music. Yes, I do believe that music is usually best served when someone with a good artistic knowledge of the historical or idiomatic context performs the music. To put it naively: I often think that Norrington’s Beethoven works better than Von Karajan’s. Rhythms are sharper, the overall feel is not so pompous, there is a wonderful transparancy, the woodwinds sound emancipated. Yet musically speaking, Von Karajan’s interpretation is quite convincing too. The slow dance-like character of the second movement of the Seventh Symphony seems to me to have a much more intense and obsessive atmosphere in Karajan’s performance from the seventies, than it has in Norrington’s from the nineties. But then I grew up with Karajan’s recordings, not with Norrington’s. So maybe it’s all a matter of taste? A well-known Belgian forte piano player once told me that he could no longer stand the Beethoven sonatas as played on a Steinway. For him, the sonatas were “raped” when played on a modern piano. 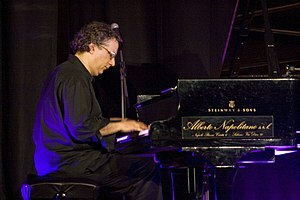 Asked for his opinion on Schnabel’s interpretation of the piano sonates, he looked at me with a mix of anger and compassion and said: “That’s even worse.” Faced with this kind of radical attitude, I usually start praising Uri Caine’s equally ‘radical’ interpretation of Bach’s Goldberg Variations. I subsequently portray Uri Caine as a risk-taker, taking more than his share of liberties with the famous variations, and how absolutely adorable I find his interpretations of Bach – or, to speak with the words of Marcel Cobussen (actually referring to Zacher’s Kunst einer Fuge): Caine’s encounters with or invitations to the work of Bach. In performing plainchant from late medieval sources, I want the listener to encounter this music in a mode or a mood to his or her liking and situation. I want to invite people to experience the power of ‘spiritual’ music through the simplicity and purity of primitive monody.